I like single collections – full collections, that is – but if you’re not overly familiar with a poet’s work, you never know if you’ll enjoy all of their poems and most of them cost between £8 and £12 each. I like anthologies but sometimes it isn’t satisfying enough to read just one poem by each poet – I find myself wanting to read more by particular poets and less by others – a lot depends on your own tastes coinciding with the anthologist’s tastes. 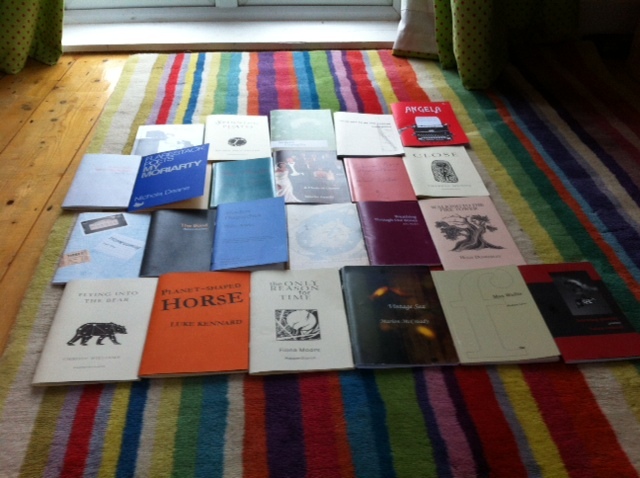 Poetry books, when they’re not excessively slim, can be weighty (admittedly, not that often – perhaps unwieldy is a better word) and take up a lot of room in a bag whereas pamphlets are delightfully petite! And most of them are exquisitely beautiful objects – you find yourself reaching for a napkin (or the edges of your cardigan) if you happen to be reading a pamphlet while eating garlic bread – you don’t want any buttery smears on these beauties. I like magazines but sometimes they’re hit or miss – one issue can be crammed with fantastic poems and interesting reviews and articles but the next issue can disappoint. Pamphlets often cost £5 or less – most magazines charge more than this per issue. Here is a list of the pamphlets pictured above. I enjoyed all of them and will try to say more about some in the coming weeks. Hugh Dunkerley’s Walking to the Fire Tower (Redbeck Press) was acquired many years ago but the other books were bought in the last year or two – a few were kindly sent free of charge by the authors after we’d chatted through the internet but you can’t count on this happening too often, of course! When I ordered direct from the publishers, which was the case for the majority of these pamphlets, everything was sent one or two days after I’d ordered – just as fast as a well-known company famous for not paying all of its taxes. Angela by Chrissy Williams and Howard Hardiman (Sidekick Books) and Badger by Howard Hardiman (Cute but Sad Comics), I bought from a stall at Melksham Comic Convention. I can’t remember how I came to own Glad not to be the Corpse (Smiths Knoll) by Lydia Harris – I don’t remember ordering it – but it’s very good. I was going to add links so that you could easily find the publisher’s websites but that will take me a long time. You should be able to locate all of these by searching on the internet but do get in touch if you have trouble finding any. Poetry pamphlets would make very excellent stocking fillers wouldn’t they? But SURELY nobody is thinking about that yet……. I know someone that gave a pamphlet instead of a birthday card, which I thought was a genius idea! A lovely paean to the pamphlet. I agree. Glad and not at all surprised to learn that you’re also a pamphlet aficionado, Robert! Excellent! What a great pic, and thanks for the list – many on here I’ve not heard of, some I have and others on my wishlist. Good idea to do some mini reviews, I may try the same – I’m not great at reviewing but I guess you have to learn by reading AND doing. I agree with you the smaller ones are particularly pleasing. I like the look of Iota Shots and Tall-Lighthouse pamphlets, very neat. Hi Robin! I didn’t intend this as a ‘review’ at all but I keep meaning to post longer comments on some of the books I’m reading. I seem to have a hit both a busy period and (dare I whisper it) a reasonably fruitful writing spell so my blog is being neglected, somewhat. I will make amends soon! Oh sorry, I only mentioned ‘mini reviews’ in that you said you’d be saying something about them over the coming weeks, so I just thought …. anyhow, review/comments – it’s all interesting!